The first weekend I had my bike, I did two trips. Then I didn’t ride all week, mainly because I was working crazy hours and didn’t want to ride in the dark. But also because it was bucketing down on Wednesday, which was the only day I wasn’t at work. Not game to ride in the rain or the dark yet. Total distance: 0. This weekend, I didn’t do as much riding as planned, because I was at the Home Show on Saturday (of which more, anon). But I went out on Sunday and rode to Aldi. That’s a kilometer, maybe a little more. Call it a 2Km round trip. I parked out the back (later discovered I could have parked a bit closer) and had to stuff everything into a couple of carrier bags and juggle it all the way back. I find shopping at Aldi to be confusing and disconcerting. I bought a $15 bike pump, some flowers, a daggy yellow fluorescent vest, some caramel popcorn and a bunch of bananas. Also coco pops, orange juice and cheese. Total distance: 2km. Total cost per km: $320.45 (including the pump) (not including the coco pops etc). 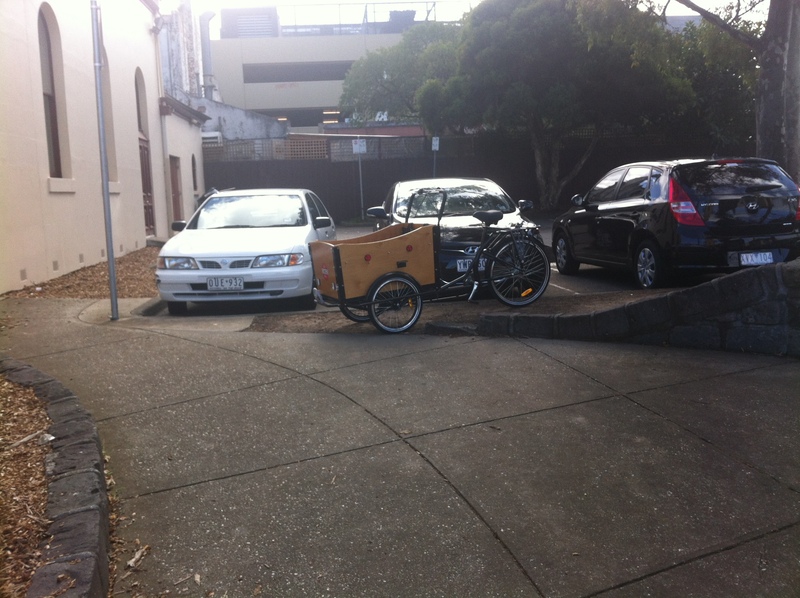 My bike, parked in the carpark. Next time I'll park it at the bike racks round the front. 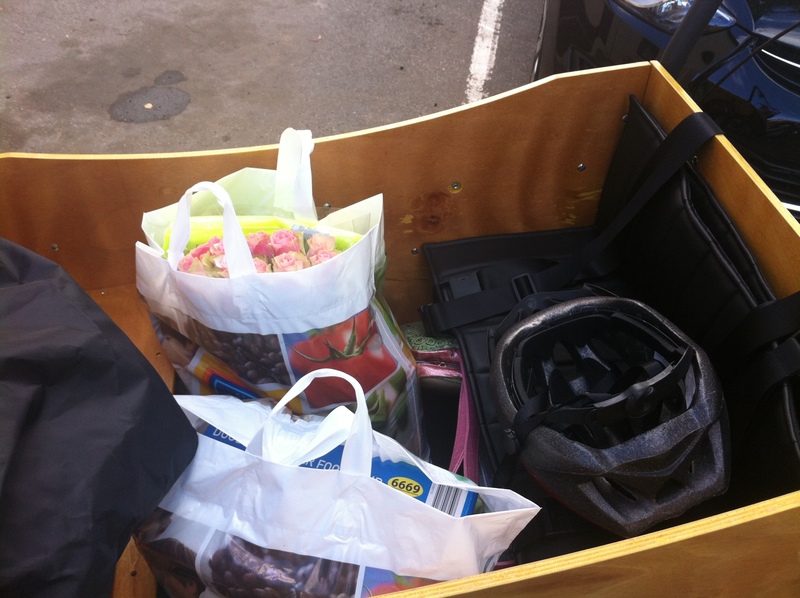 The good news was that even loaded up with shopping my bike was not noticeably heavier or more unwieldy to ride. And the flowers were a nice touch. Two over-stuffed bags of shopping. I covered the coco pops with the waterproof cover because I was ashamed. It took me six minutes to ride home. That’s already faster than walking – and considerably easier, given what I was carrying. And I rode on the road and I did not entirely freak when the learner driver passed me. I don’t think they were going much faster than me, to be honest. Still not game to ride at night, though. And I walked the bike across the intersection. Next weekend I want to go to Aldi TWICE. There are ceramic knives, slow cookers and Lemsip Max to tempt me. And a foot massager and pink “Ladies’ toolkit” from Wednesday. I am very impressed. Does it have seats for the kids in the cargo bay? What is the turning circle like? I rode on with a bigger tray in the front, room for 4 small kids. The steering had a good turning circle but was very strange to ride when on full lock. There are two double seats for small kids in the cargo bay, facing each other. You can see one, with black padding & 2 seatbelts, to the right of the shopping pic. The other is plain wood, to the left of the pic. At 9, Otto pretends that she still fits. She can do the belt up around her tummy but not over her shoulders. The turning circle is a bit rubbish actually. And on a trike, you have to lean into the turn. Easiest is to hop off & then haul the back around (I have to do this when parking on the front porch anyway). Fortunately, the back end is not heavy. You’re welcome to come over one day & give it a try. I’d love to have a go. But do not know when I can make it down there. I am in the city on weekdays, but have to rush home to do dinner, and kids things. Whenever 🙂 Bring the kids too. I hope that you realise that you are now officially a hipster! LOL – I am not sure that my bike qualifies. Or is this one of those “the daggier, the better” situations?